For a little while, I'd been a little hesitant about reading Fangirl because everybody appeared to be totally fawning over it and let's face it, nobody wants to be the black sheep and be part of the few that don't like something. Plus, I'd read Eleanor & Park before I read this book, and wasn't too keen on it, which made me a little nervous. And the on top of that I had about five people telling me that it's boring, so that didn't help too much either. Thankfully, I managed to breeze through Fangirl, and ended up really liking it (good thing I ignored all of the people who told me the book was boring)! 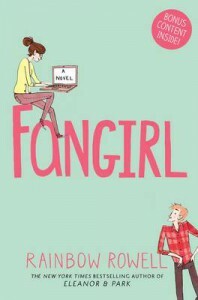 Fangirl is the story of Cath, a college freshman who is on her own for the first time, after her twin sister Wren wants to be her own person and not a twin anymore. Rather than going out partying all the time, like Wren wants to do, Cath wants to stay in her room and write her popular Simon Snow (an incredibly thinly-veiled Harry Potter parody) fanfiction, which has suited her just fine throughout school. I liked how light and easy-going Fangirl's story was, which suited me just perfectly considering that I've been in the mood for light contemporaries very recently. As I'd said above, a few people were telling me that the book is 'boring, and I can't help but disagree with them. Just because there's not any action in the dictionary definition, that doesn't make it boring. I think that Fangirl moves at just the right pace, and is exciting in its own unique way that maybe some people just don't get, and that's totally fine. Moving on to the romance of Fangirl, it was so cute and fluffy that I just couldn't handle it. I loved both Cath and Levi and actually being able to see their relationship develop from being friends, to dating, and then being in love, which is where Eleanor & Park failed for me. The plot took its time with it, so when it got to the point where Cath and Levi were expressing feelings for each other, it was incredibly satisfying and I wasn't let down at all. My favourite part of Fangirl (and also why I liked this book more than Eleanor & Park) is definitely the characters. I love how complex they are and how I didn't simply like them all the time. There were times where I liked them, others where I was frustrated by them, and even some times where I wanted to slap some sense into them (especially Cath, with her aversion to writing original fiction). These days, I'm really enjoying reading characters who are so complex that I go through a full spectrum of emotions, rather than just liking them from page one, especially in contemporary fiction because it just makes the characters seem more realistic. Let's face it, we've all been annoyed by our own friends at one point. I loved Cath as a protagonist, but at times she reminded me of myself so much that it was actually kind of scary. There have been plenty of times in my first year of uni that I just wanted to stay in my room on my laptop rather than going out and socialising, and eve more times that I've been too shy to talk to people. And also, like Cath, writing is a huge part of my course, but I'm not a fanfiction writer. Cath's aversion to writing original fiction actually got on my nerves and everything that her fiction writing professor says to her about it is completely true. When you write original fiction, nobody expects you to create an entirely new world, because everybody writes different things (I mainly write crime/thriller stories that take place in the 20th century; no need to create a new world because it's already there), and the feeling of falling is the whole point; none of us know what we're doing. As for Levi, the way I felt about him is a little strange. I didn't really have an opinion about him at first, but as the story progressed I definitely started to like just how sweet and caring he is. I loved how much he cared for Cath, it was just so adorable. One of the things that surprised me the most about Fangirl is that it's more than just a college love story. Not only do we get romance, we also get themes of growing up, family, and mental illness, which I think made the story richer than if the story was simply just about Cath and Levi's relationship. When it comes to the plot involving Cath's dad and his mental illness, I thought that this was particularly important because mental illness is something that is still misunderstood in modern society, and is close to me because both of my parents have depression (my dad once took time off from work for four months and ended up having to take anti-depressants, while my mum has had depression since I was born), and sometimes it's hard to understand what people go through, especially when they try their hardest to not show that things aren't right. Another thing that I loved about Fangirl is that I think that it took kind of a neutral stance on the subject of changing who you are. Wren isn't exactly condemned for changing who she is in order to impress other people, but Cath isn't really praised for being the same person she was in school. People can change if they want to, it's their life and nobody has the right to tell you who you should be and the life you should be living. I'm so glad that I liked Fangirl. I loved the story, the characters, and I still can't get over how satisfyingly cute Cath and Levi's relationship is. I'm not usually the kind for re-reading books, but I may be giving Fangirl a re-read sometime in the future, and I will definitely be reading more of Rainbow Rowell's books!